Buy Faith in Nature Hemp & Meadowfoam Conditioner 400ml in the UK from our online shop or directly from our independent Scottish store. Hemp & Meadowfoam Conditioner for normal to dry hair. This refreshing blend of Hemp and Meadowfoam is infused with Ginger and pure essential oils of Lemongrass, Mandarin and Grapefruit. A citrus burst to help you embrace the day. 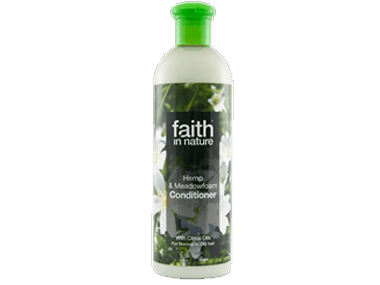 As official Faith in Nature stockist, we sell genuine Conditioners directly from our shop in Scotland and online throughout the UK. View more products from Faith in Nature. Where can you buy real Hemp & Meadowfoam Conditioner safely online? If you are wondering where you can buy Faith in Nature Hemp & Meadowfoam Conditioner 400ml safely online in the UK, then shop with us. We are an actual health foods shop; with real people selling real foods and products. Our award-winning independent shop is located in Stirling, Scotland since 1976. You can buy our Natural hair and body care and other genuine Conditioners in store or safely place an order with us online or over the phone. Hemp & Meadowfoam Conditioner - Faith in Nature Hemp & Meadowfoam Conditioner 400ml in Conditioners and Hair Care.